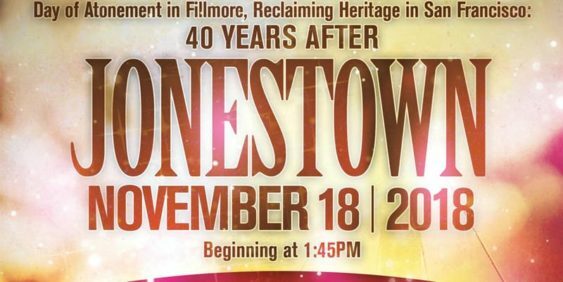 The New Community Leadership Foundation (NCLF) and San Francisco Beautiful (SFB) present, “Homecoming: Day of Atonement in Fillmore, Reclaiming Heritage in San Francisco: 40 Years After Jonestown”. Since the tragic deaths of 918 people at Jonestown, Guyana on November 18, 1978, this is the first public tribute in San Francisco to acknowledge the tragedy and devastating impact that the People’s Temple had on the families of the Fillmore and Western Addition. It is a celebration of people coming together in the name of the Fillmore/Western Addition to reclaim the full humanity of the people who perished and to lay a foundation to dedicate a space where in the future, people can stop, pause, read and reflect on the community’s deep and vibrant legacy in San Francisco.